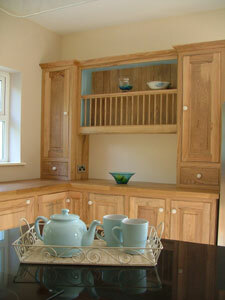 Kevin Toomey Kitchens & Cabinetry, based in the picturesque village of Foulksmills, County Wexford, design and make beautifully handcrafted solid wood kitchens and furniture from the finest quality Irish and imported timbers. All tastes are catered for from classical to contemporary styles. Each piece is carefully crafted using a combination of traditional joinery techniques and modern technology. All work is designed and crafted from start to finish in our own workshop. All furniture is fitted out with the highest quality hinges, handles and accessories. We pride ourselves on the quality of our work and our attention to detail. A large range of kitchen appliances from leading manufacturers can also be supplied as part of your kitchen design.